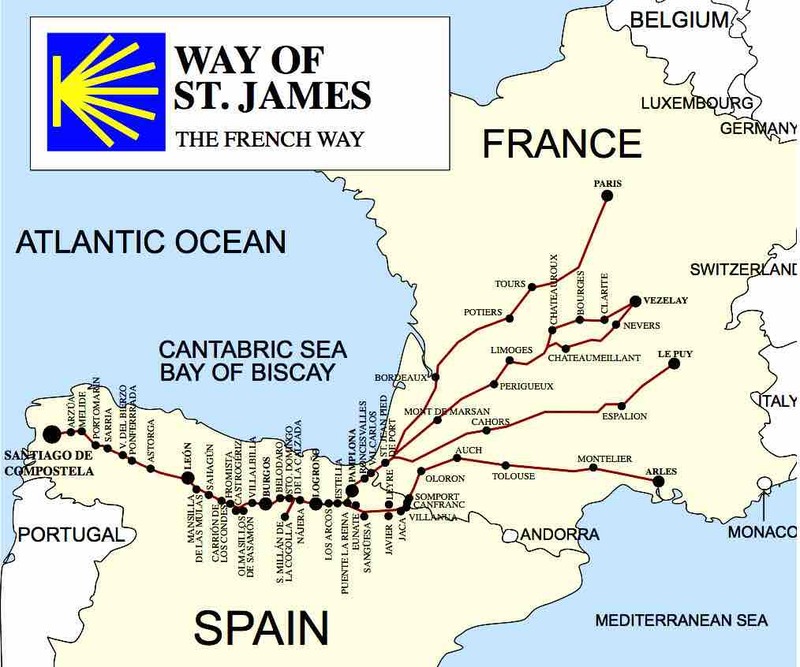 Today, the most popular pilgrim route to Santiago is the Camino Francés, some 780 Kms in length. Leaving Saint-Jean-Pied-de-Port, France and the mountainous terrain of the Pyrenees, the pilgrim soon confronts the vast, open, flat plains of central Spain with only sparse shade for protection. After Astorga, he will find himself climbing steeply, reaching 1,505 metres at La Cruz de Ferro, before descending in fits and starts towards Santiago. Nowadays, it takes the modern pilgrim 32 to 45 days to complete the journey. Because we live close to the route which starts in Arles and which eventually winds up into the Haut Languedoc and beyond, we keep bumping into people who have walked some or all of Camino Francés. In a mad moment, like so many things in our lives, we decided to find out what the fuss was all about. When to start and where? We would walk into Santiago but where to start? As this was a spur of the moment decision, we found we didn’t have sufficient time to walk 100kms, the minimum required to obtain your Pilgrim’s certificate, but that was not a problem. 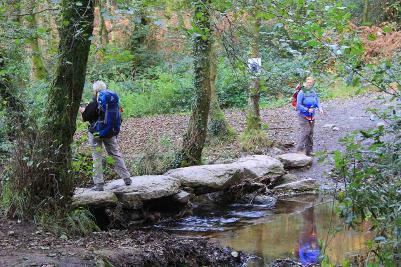 If we enjoyed the experience, we would no doubt walk other parts of the Camino and gain our certificate another time. Little did we know what a drug walking the Camino would turn out to be! But that’s for the future. We set aside five days for walking and four days for travelling. After examining maps and checking terrain, Palas de Rei seemed a good point to start. Our guidebooks implied it was 66.5kms from there to Santiago. Fine on paper but the 66.5kms overlooked additional walking distances to our hotels and the hilly ups and downs! ‘Hotels!’ I hear you say. Yes, we decided to copy Charlemagne and add a bit of luxury to our walk. I am afraid to say the hostels and albergues lining the route didn’t hold any attraction at this point in our lives. Then there was the training or lack of it! We did intend to train beforehand but other things got in the way. Nonetheless we were relatively fit, or so we thought. We not only walked our dog twice a day but we were also part of a walking group. We should be OK as the longest day (on paper) would cover 18kms and we had all day to do this. Hindsight is a wonderful thing! Three of us left the Hérault one Friday in September 2014 in bright sunshine, heading for a Spanish border town just outside San Sebastian, half way to Palas de Rei, which is some 1,260kms from home. If the hotel in Usurbil was an indicator of the hotels we had selected, we were on to a winner. The hotel was in the countryside, not far from the motorway. It was very clean, with all mod cons but the best bit was the cider cellar restaurant or Sidería. €5.40 allowed unlimited access to different ciders or red, white, rosé or cava wines, all drawn from huge wooden vats. Drawing the liquid from the vats was an art, as we found out. We sat at long tables enjoying good honest food whilst appreciating the great atmosphere. It turned out to be a very enjoyable stay, both on the way to Santiago and on the return home. Next day, and without headaches, the three of us headed off towards Palas de Rei. Passing Burgos, where the Camino runs parallel to the road, we had our first sight of our fellow pilgrims. Watching the small groups of them weighed down by large backpacks saw us contemplating the fact that tomorrow we would be doing the same. Then, just to help things along, approaching Palas de Rei, the weather changed and not for the better. Down came the rain. We drove past groups of pilgrims wearing plastic cagoules in a vain hope of keeping themselves dry, head down to avoid the rain, heading for Palas de Rei and a dry place to rest. Was this an omen for our walk? It would explain why Galicia is the greenest part of Spain. What had we let ourselves in for? Checking in at our second hotel, the owner asked for our passport. ‘Have we not just given them to you?’ ‘No your pilgrim’s passport.’ ‘Oh, we don’t have one of those, we are not walking the 100 kms.’ ‘You should have one, as, once you have walked 100 kms of the Camino, you can obtain your certificate. You don’t have to complete it in one go. It is also a good souvenir for you to remember your walk.’ ‘Thank you!’ Hunting high and low, they found two passport books but, for the third, told us to visit the church after mass that afternoon. Turning up at the appointed time, we joined a small queue of pilgrims getting their passports stamped. ‘Yes we have a passport, €1 please and here is your first stamp’. We were now equipped for the walk! For the record, there appears to be an etiquette regarding stamps. Originally, you needed two stamps a day from religious places along the Camino, one in the morning and one in the evening. Today, stamps are available from all sorts of establishments along the route. The number of stamps collected differed according to nationality. Visitors from Asia seemed to get a stamp at every opportunity, whilst others seemed to select particular types of establishments. For us, a stamp from places in which we either ate or stayed the night or from any churches we passed and visited en route was sufficient. Palas de Rei, is a small village with all facilities. Here, we discovered one of the amazing side benefits of being a pilgrim. All along the route in Spain, meals for pilgrims are served. They cost around €10 for a three course meal including wine, with choices for each course. By no means gastronomic, they are good home-cooked meals. We were to find out that walking the Camino was not going to be too hard on the wallet! This remained true, even in Santiago. And so to the walk itself. Rising whilst it was still dark outside and after a good breakfast, we set off just as dawn was breaking (around 8.00am!). Having packed our main bags and left them in reception for onward transportation (the best thing about this Camino is that your bags can be transported from any lodging to another for 3 Euros), said goodbye to the car and, with a spring in our step, and day packs on our backs, we soon joined other pilgrims on the way to Santiago. What’s more, the weather was kind, with the sun rising high into the sky. withthe path crossing a number of small streams via interesting footbridges! Interspersed along the route were small hamlets, containing fascinating religious and vernacular architecture. 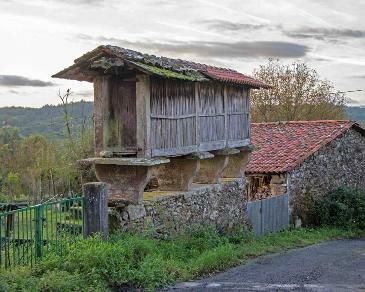 We were used to apple stores in England but had never seen the Galician grain stores before – miniature, ornate stone and timber-built stores found in the gardens of all old houses. We passed by chapels which once welcomed pilgrims but which were now closed, old pack horse bridges which have stood the test of time, exhibiting signs of a long working life. Gouges in stone made by wooden carts, long retired. Only two stops on our first day’s walk – must try harder! First for coffee and then for lunch. We did though arrive at our next hotel on the edge of Melide before 3.00pm and tea in the lounge was so welcome! We congratulated ourselves. Walking the Camino wasn’t going to be as hard as we had feared! Today, we walked close to the expected 15 kms, so we could trust the books! Following a quick nap, we ambled the 1,500 meters into town, for a good touristic look around, avoiding the town’s speciality dish, octopus pulp (‘pulpa a la Gallega’). Time for dinner – we do seem to be eating a lot! We found a restaurant serving good tapas with wine and started to people-watch - families enjoying themselves in the sunshine, fellow pilgrims hunting for supper and commuters boarding long-distance buses at the end of a weekend. Life is good. With full stomachs, we retired to bed. Even though our hotel was on a main road, everyone else had the same idea and silence enveloped the town. The next day promised another pleasant walk. Nothing like lulling yourself into a false sense of security, as we were to find out very soon! Seems we were the last down to breakfast. Tea or coffee, fresh orange juice – of course, rolls and pastries, fruit and cereals. What a great way to start the day and we would surely walk it all off! Main bags left in reception to be picked up later and taken to our next hotel. We were out of the door by 9.00am. and cemetery before descending into the valley to find welcome shade provided by areas of eucalyptus woodland (planted to provide a high quality wood pulp) next to copses made up of deciduous trees. These soon disappeared, to be replaced by open fields with wonderful views across the apparently untouched Galician countryside. Once again, we crossed several clear streams, including using one very tricky narrow, stone bridge with no handrails. No, we didn’t get wet nor did we see others fall in! -ful green environment. As the day progressed, the line of pilgrims stretched out forming small groups, so that soon we were walking on our own with time to reflect on the walk and what, if anything, it meant personally, from a spiritual point of view. Today saw more frequent refreshment stops, four in all, including one just for ice cream! Well, it was hot! Common throughout the Camino, sometimes we were to stop in out-of-the-way spots, other times in small hamlets. What they all had in common was that they provided opportunities for fellow pilgrims to talk to relative strangers about shared experiences. Late afternoon, time to get out the GPS. Arzua, our destination, appeared on the screen but where was the hotel? Then we saw that it lay somewhat off our route and before reaching Arzua, we had to descend into a valley and walk up the other side. Unfit or not, it was best foot forward. What a sight we must have looked as we staggered into reception! It was enough for the receptionist to tell us to sit down whilst he fetched some cold drinks. Oh boy, was that a welcome gesture! Some time later, after a soak in the bath, drinks on the terrace watching the sun go down (well, we had earned it!) and an excellent dinner in the hotel restaurant, we calculated we had walked around 18Kms that day, up hill and down dale. Worse still, we found out that, had we booked directly with the hotel, we could have had a free taxi from the centre of town to the hotel! Not a lot of use being told this after the event but we made good use of the knowledge the next day! As a side note and a typical Camino experience, we were joined at dinner by a very nice lady from Australia. 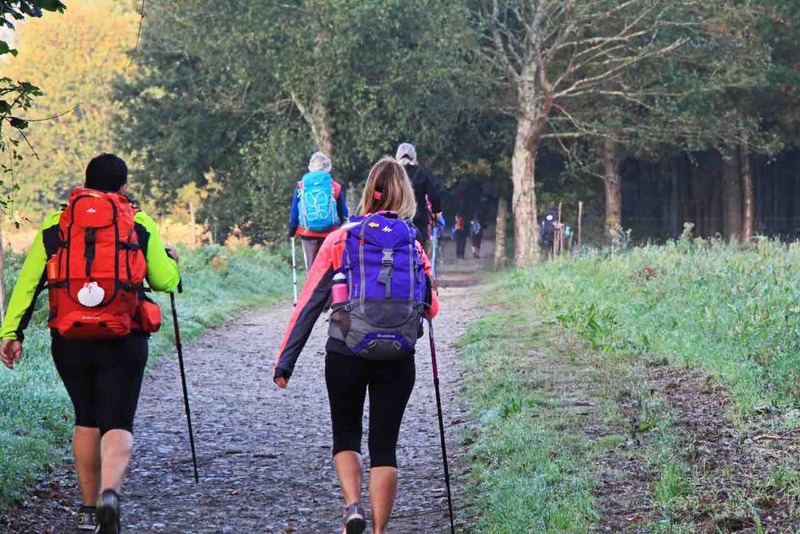 She had started walking the Camino at Saint-Jean- Pied-de-Port with a group of friends but had had to let them go on without her whilst she resolved a problem with her ankle, having twisted it just after Sarria. She was the first of several people we were to encounter who had had accidents en route. The Camino was not a walk in the park and we had done no training! Our poor guardian angels would be working overtime! The Australian lady did finally make it to Santiago and met up with her companions. The alarm went off at 7.00 and it was still dark outside! Our cursory planning had day 3 down as the one with the longest walk. So, after a quick shower, getting dressed, attending to blisters (not me!) and packing the case, we attacked the very good breakfast table. We needed the energy, even after last night’s wonderful dinner. We had arranged for a taxi to collect us at 9.00 and take us into the centre of town where we would join the Camino once again. Another beautiful day weather-wise, with the sun rising into a blue sky, mist in the valleys slowly lifting. Once again it was forecast to be a hot day. As during the previous two days, we were soon joined by fellow travellers on the Camino, quickly falling into an easy series of short conversations with other pilgrims, as we all proceeded towards Santiago. Today’s walk passed through undulating countryside, mostly under the shade provided by the ubiquitous eucalyptus trees of this area, finishing with a climb around the Alto de Santa Irene at 405 metres. We traversed three river valleys, crossing some ancient bridges and passing by many small farmhouses. The last two climbs were virtually to kill us! three times today, the highlight being a small ‘Casa’ at the bottom of a hill called ‘Casa Tia Dolores’. We arrived there around midday, just in time for lunch. Like most cafés on the route, it was rustic, with tables set up under various forms of awnings. Having selected from the menu, the husband came out to take our order. Next, we heard him speaking to his wife in the kitchen over the intercom and, a few seconds later, we heard her reply. Her voice needed no intercom for her husband to know what he had to do! A lovely couple! They cook their own pies in a wood-fired oven, simple but nourishing meals. They also craft a beer called ‘Pilgrim’. Once drunk, you are meant to make a wish and leave the bottle behind. At Christmas, they hang all the bottles on a Christmas tree in the hope the wishes come true. The day’s walk was to take us just over nine hours. It was the hardest of the five walking days. We covered around 23 to 24 kms which turned out to be the longest of the 5 days walking. There were a number of small climbs and descents and we did take it easy, making sure we had sufficient rest stops but it was a very long and tiring day. Not helping matters was the fact that the pension turned out to be at the far end of the town, adding about 3 kms to the day’s walk. However, the modern pension was beautifully clean and comfortable, on the outskirts of O’Pino. We were welcomed royally and given directions to a good restaurant in the town for our evening meal. After yesterday’s marathon march, today was going to be a shorter walking day and a welcome change. Taking advantage of this, we treated ourselves to a late breakfast which turned out to be more comprehensive than we had envisaged. Being a very simple pension, we were only expecting coffee or tea and patisseries but we were treated to orange juice, breads and cereals, yoghurt and fruit, in addition to the normal fare. and there were no clouds. 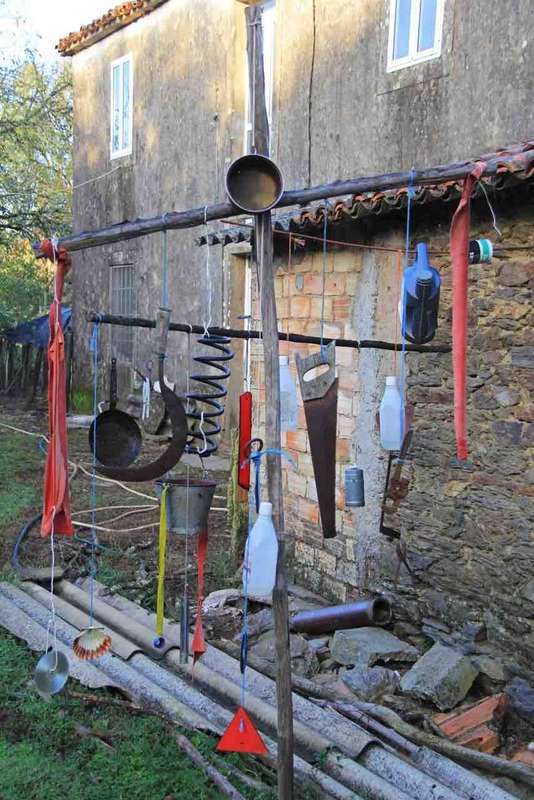 The residents between O’Pino and Lavacolla were creative people as, on several occasions, we walked past houses with ‘interesting’ works of art - a sculpture made from old items of junk, such as old tools, plastic bottles, car parts hanging with string affixed to scaffold. In another case, someone with more skill had fashioned animals out of wood off-cuts. On another occasion, we first thought we saw an old lady sitting in a vegetable patch, only to find that it was a very good facsimile using a shop dummy to scare the birds away! As we were sitting eating, an elderly couple, whom we had seen earlier, making their way towards the airport, slowly walked past, hand in hand. ‘Do they live in the village?’ we asked. ‘Yes, they are cousins in their 90's and they do the same walk every day, come rain or shine.’ There is hope for us yet! Just as we were finishing up, we were joined by three East-Coast Americans in their late 20's who had started their Camino in Roses, on the Costa Brava. They had taken time out before leaving New York and moving to Florida for better weather and who could blame them! We left them sitting in the sun and continued onwards, stopping first to see the chapel in San Payo before climbing out of the valley via a steep gradient. Well, that worked off the chips. Crossing under the main road to Santiago via a tunnel, we were suddenly overtaken by a large group of primary school kids, running as fast as they could and enjoying the freedom of the outdoors, with the teacher lagging some way behind them. Now we were descending down towards Lavacolla. Early afternoon and it must have been in the high 20's and not a lot of shade around. We passed an elderly woman in her fields hand-picking sweet corn. She had two hats on to try and deflect the sun's rays and keep herself cool. Her progress was slow as she either snapped or cut off the cobs, placing them into a basket. Once full, she then carried the basket over to her Galician grain store. We continued onwards, passing the school for the children who had run past us, and entered the main part of the town. We spotted an albergue, closed for a few hours but offering some shade from the midday sun. An easy decision was made to rest under cover, away from the heat of the day. A wonderful respite and a chance to rest weary feet. A little while later we continued on into the heart of Lavacolla, reaching the main road. Our hotel should have been close by but there were no obvious signs to it. Time for Google maps. ‘Ah, we need to walk alongside the main road, uphill for around 2 kms.’ ‘Do we have to?’ ‘Yes!’ So, in the heat, we struggled uphill, being barraged from time to time by traffic noise. ‘Are we nearly there yet?’ ‘Almost.’ Then the sign to the hotel and a descent towards it. We decided a glass of wine before dinner was in order. “Would it be possible to order a glass of wine from the bar?” “But of course” came the owner’s response. “I will bring it to you in the lounge.” A bottle of good white wine duly arrived, together with a bowl of nibbles and all for the grand sum of €5. That evening we were driven into Lavacolla with a recommendation for a particular restaurant. After checking out menus posted outside a couple of restaurants, we decided to go with the recommendation. At 7:00 on the dot, the restaurant opened and we three joined fellow our pilgrims seeking a table in the restaurant. All 3 of us opted for the ‘pilgrim’s menu’ and were duly served three substantial courses. Soup with thick bread, followed by a plate stacked high with pork chops and separate bowls of vegetables, all rounded off with dessert. Wine was included, a half bottle to be exact. But only whole bottles were on the table and there were three of us! “Just drink down to this mark” the proprietor said, waving his finger roughly half way down the bottle! The meal came to around €12 per person and boy, we did not leave there hungry. Despite only walking a short distance today, sleep came to all of us quickly. Our last day of walking. We wanted to get away early in order to make it into Santiago in time for the pilgrims’ service in the cathedral at 12.00 midday, so it was an early alarm call that morning. Down to breakfast just before 7.00, to join the fight for seats and the buffet table. A tour group had arrived en masse! Thanking the owner for his kind hospitality and taking note of his directions, we strode out towards the Camino. At 7.45 in the morning, it was still dark as we slogged uphill from the hotel, on what proved to be a long climb from the valley to the top of the hill, once again passing through eucalyptus woodland. As the sun rose, we passed through the last hamlet on the outskirts of Santiago where the trail flattened out. For the first time, we found ourselves walking without other pilgrims, as our hotel had been between recommended overnight stops. Passing through small clusters of houses, we saw no one, until, that is, we reached the TV studios marking the decent into Santiago. It was not until we reached the monument to Pope John-Paul high above Santiago that other pilgrims and coach parties joined us. A short detour to admire the huge monument and the little chapel and on down into the city, first passing through housing, then industrial areas, before reaching the outskirts proper. checking watches, set off to the Cathedral for the service. The Camino was well marked by the symbol of a shell, until you reached the old town and then the signs vanished! Never mind, you should be able to find the Cathedral, after all, it is a big building. We could see its spires over the rooftops, but how to reach it on foot, with such narrow streets? After a circuitous route, we found ourselves at the door of the Cathedral of Saint James. I admit that we did not enter on our knees but joined the masses of pilgrims at the service. We saw several fellow pilgrims with whom we had talked on our Camino walk, all partaking in the service. We were particularly lucky to have attended a service at the Cathedral on this particular day. 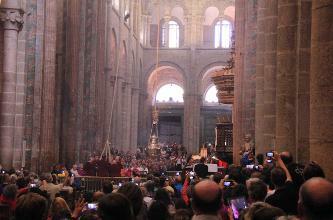 The huge Botafumeiro, the silver-plated censor weighing about 60kg (100 kg when full) and 160cms high, is only now used on certain religious occasions or when a visiting group pays for it to be swung on its 35m long rope. This was one of those days and, we are glad to say, it did not overshoot and end up outside the Cathedral, which has happened in the past. Coming out of the Cathedral and walking towards our hotel, whom should we bump into but one of the New Zealand ladies we had met previously. So they had reached Santiago safely too and were staying there for a couple of days before setting off to catch their flight home. Have we completed our Camino or should we continue it on another occasion? It did not take the three of us very long to answer this question. We must have enjoyed it (despite the aches, pains, blisters and bad backs), as all three of us instantly said, whilst eating in Santiago, that we must come back the following year. Yes, we all wanted to walk another part of the Camino. We debated whether to walk part of the Via de la Plata, to walk another part of the Camino Francés – between Burgos and León perhaps – or whether to continue on from Santiago to Finisterre. The latter possibility won out.